We are pleased to have Justin Mathews here for this edition of The Tonight Show. 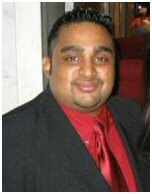 He is the ambitious creator of DesiDestiny.com. Justin, a network administrator, and Drexel University alum, can be described as a man on the go, and a person that enjoys being around people. Chung Lao: Hey Juby, how are you? Chung Lao: When was your website, DesiDestiny.com, founded? Juby: The site was founded sometime in June of 2003. It finally came to life and launched on Valentines Day of this year. Chung Lao: What is its purpose, and how does it work? Juby: The purpose of our website is simple—making the search for a significant other as easy as possible. We designed our website and company around this. What’s the use of a service that’s far too complicated to comprehend? It works very easy. A user comes to our website and signs up as a member for free. He or she can view all of our options, as well as search for a mate. If that person then wants to take the next step to contact that person, then he or she will need to sign up for a paying membership with us. A paying membership will also give that user many more options and products to choose from the site. Chung Lao: What is your success rate? Juby: I had to remove someone the other day that said they had found their Husband using our website. That felt pretty good. There is a big difference between the amount of people that are paying members and that are free members. The site is paying for itself right now, but there’s always bigger and better things to do with it and its functionality in order to compete with some of the other TRILLION Indian dating sites out there. Chung Lao: How long has it been online and how many members do you have? Juby: We have been up and running for about 8 months, and have brought in approximately 30,000 members. Chung Lao: Do you think it’s safe to meet someone online? Juby: Yes, I do. In fact, I am thinking of adding more security to our site—like features that do background checks on members so that they are verified that they aren’t a con, etc. I’m willing to go that extra step so that our customers will refer us out to others. Chung Lao: What is your take on arranged marriages? Juby: Well, arranged marriages to me is more of a tradition. In my life, I choose which traditions to take and not take. I won’t be going the arranged marriage route, but I’ll tell ya what, they don’t seem to fall apart as fast as the 51% divorce rate here in America. I think it’s just personal preference. Juby: I think it’s pretty cool. Building a community online isn’t the easiest thing to do, I say that from much experience, and it seems like you already have a grasp of this concept. Good job. Juby: I am pretty split about this topic. If they had Nukes, well sadly, yes I support it because of course we would have to police these people. But since our motive should have been to continue on to find the man that disgraced and damaged our country with the horrible day of 9/11, then we had no business going after Saddam. In fact, how many people knew we were even on the hunt for Saddam before it all went down? In the end we are seeing that it was a mistake. Osama is still sleeping in caves, yet families here are suffering because of their tremendous losses. I still think we were all misdirected. Juby: A lot of people say I get my leadership qualities from my Father. I know the life he had in India, and the troubles of becoming successful here in the states, while supporting all of his large family here in the states as well. I love his hard work, and I know that he’s always done what is best for his family first. His sense of humor and his laugh are unlike anyone else. When I started all these companies, of course he could’ve said “no, what are you doing, where are you spending your money”, etc. But he didn’t He supported my decisions, and there’s not many people that would have stood behind you when taking major risks like this. For this, I choose my Dad as a person I most admire. Chung Lao: Name some countries you would like to visit and why. Juby: I would love to go to Europe. This is something I’ve always wanted to do ever since high school. So many places to see over there: Paris, Ireland, Rome, etc. I am definitely going to go before I get married. I think spending a month over there would be an excellent experience that I’ll never forget. Chung Lao: How’s the fantasy football team going? Juby: So far so good. I have 4 teams right now, and I’m at the top of each league. Michael Vick is flat out killing me though. Anybody want him? I’ll sell him CHEAP. Juby: Ulterior Motives. Scam Artists. People that use you to get what they want. Juby: Don’t ever let anyone tell you you can’t do something. I have been age discriminated more than race discriminated in my 25 years on this planet. Don’t let your age be a deterrent in reaching your goals. Believe in what you are doing and follow through with it, and you will accomplish anything you ever try. Chung Lao: Thanks Justin. Next up on The Tonight Show is Michael William George.